Michael Jackson’s death meant a lot of different things to a lot of different people. For Japanese television celebrity Dave Spector, it meant being woken on the morning of June 26 at 6 a.m. and spending most of the next two weeks either studying or commenting on the performer for the benefit of Japanese television audiences. And, as has become the norm whenever major news breaks in the English-speaking world, Spector has been busy appearing on dozens of programs, helping the Japanese viewers make sense of it all. Dave Spector originally came to Japan as a producer with the American television program “Ripley’s Believe It or Not,” back in 1983. By then he had already developed a love of reading “manga” comics, consequently, acquired Japanese language skills and married a Japanese, Kyoko, whom he had met in the U.S.
Having also been a child actor, Spector did not hesitate to step in front of the camera when invited by some of the Japanese producers he worked with. Having been paid to opine for over two decades, Spector has any number of insights to share, particularly on his favorite topics: the Japanese television and entertainment industries. That distinction stems, he says, from a fundamental difference in the approach to television here. “In Japan there are so many live programs. You know, you have five channels going head to head with live programming in the morning, daytime and then on some nighttime slots, too. “Compared to the U.S., where most of it is shot in big studios months in advance, the television here is so much more spontaneous.” And hence the 6 a.m. wakeup call when Michael Jackson died and, later that day, a two-hour memorial program scrambled to air by Fuji Television, in which Spector also appeared. 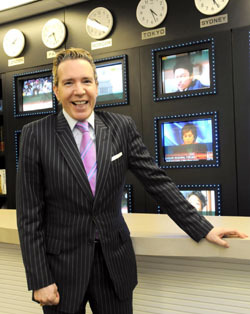 Spector often finds himself comparing and, invariably, defending Japanese television in comparisons with its American and foreign equivalents. For many non-Japanese viewers, TV here seems to be dominated by trivial and superficial chat shows. And Spector, the most visible foreign face bobbing around on that apparent sea of inanity, tends to be viewed with bewilderment, cynicism or even jealousy. Spector takes umbrage with the original premise. Asked whether sweeping condemnations of Japanese TV are really off the mark, he quickly replied: “That’s a completely false assumption. Granted on the surface it can look very silly and juvenile, but there is some excellent programming that can put U.S. television to shame. Spector does agree with the detractors on one genre, though: television dramas. Speaking in English, he launched into the kind of critical flourish for which he has become famous for delivering, on air, in flawless Japanese. “The dramas are awful. I was the first person in line to say that. The acting is bad. They have low production values, no sense of script. They’ve never excelled at that. They’re just bad,” he said. He explained that the main problem was the system by which prominent nonactor celebrities are given lead roles. The directors and writers, he added, don’t understand why U.S. dramas such as “24” are so successful. “You look at Glenn Close in ‘Damages’ or James Gandolfini in ‘The Sopranos.’ Japanese drama directors can see that, ‘Oh, this is like a movie.’ But they don’t understand the acting difference, or the idiosyncrasies of the script, or the subtleness of the humor,” he said. Much of Spector’s on-air commentary relates to foreign news. And while he doesn’t resort to duct tape and rope, he endeavors nonetheless to expand Japanese viewers’ understanding of issues that might otherwise get only limited coverage. That’s where Spector steps in. Before each appearance on a Japanese TV show, such as Fuji’s “Tokudane!” where he has a regular Wednesday spot, he arms himself not just with copious background information, but with clippings or video grabs that he himself has negotiated with foreign media outlets for the right to use. He is then able to show and describe some new aspect to a story, such as the details of the raid on Michael Jackson’s doctor’s office, which had occurred the day before he spoke to The Japan Times. “You know, if you look back at the last few decades, the most successful commentators on Japanese TV are the ones who were able to read and digest information in English,” he explained, emphasizing that his own success is due in part to his ability to digest large amounts of information in English and then turn it into Japanese commentary. The other key is to know exactly how and to what extent he should unleash his frequently barbed criticisms. “So many types of people watch TV that if you make any kind of blanket statement then someone is going to get hurt,” he said. “Like, even with these so-called “seshu” (hereditary Diet members) who everyone criticizes. They are often better than their fathers, because their fathers are just country bumpkins! But the sons might have been to Temple University or lived overseas. Now that the Michael Jackson stories are subsiding a little, Spector is increasingly asked to comment on Japanese politics. “They know I’ll say something different — and I’m not Japanese, so I’m not going to suddenly launch my own political career — so I’m a safe choice,” he said with a laugh. And what does he say about the upcoming election? “It’s the old-fashioned way they do elections here and you can say what you will,” he started. “But this is the first time the opposition actually has a chance to win. Spector clearly relishes the chance to talk about domestic issues — as opposed to always playing the role of window on the world.